In this project, I’m evaluating the performance of the 6″ SB Acoustics SB16PFC25-8 in a Dual Chamber Reflex (DCR) enclosure. At the same time, I’m also testing out a budget tweeter, a Goldwood GT-520. This is the first time I’m listening to the GT-520. I’m curious to see what a $12.50 horn loaded tweeter is capable of. For convenience, the speaker is actively bi-amped. A 24dB/oct Linkwitz Riley electronic crossover is set for 3kHz for all measurements. Microphone is at 36 ins, tweeter axis. Impulse Window = 5msec. No Smoothing applied. Frequencies below 500Hz are in Nearfield. Fig 1 – Measurements below 500Hz are in Nearfield. Fig 2 – Blue plot = SB16PFC25-8. Red plot = GT-520. Fig 4 – Blue plot = Top port. Green plot = Bottom port. Fig 6 – SB16PFC25-8 with GT-520. Crossover 3kHz. Fig 7 – SB16PFC25-8 with GT-520. Crossover 3kHz. Fig 8 – SB16PFC25-8 with GT-520. Crossover 3kHz. Harmonic Distortion of Lark DCR Fig 9 – Red plot = 2nd Harmonic. 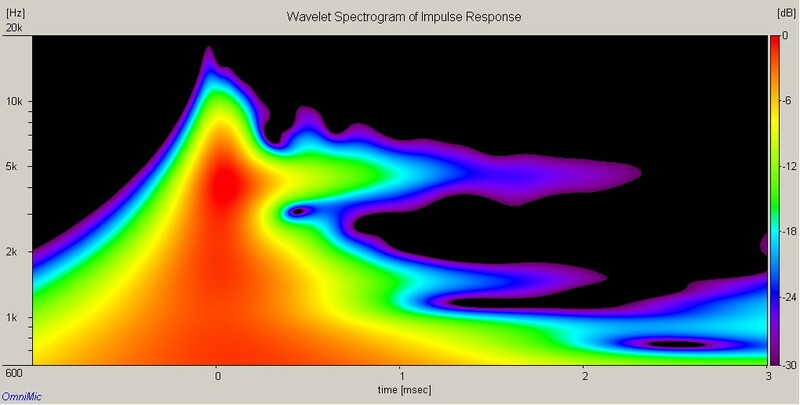 Violet plot = 3rd Harmonic. I never expected the SB Acoustics SB16PFC25-8 to sound so good in a DCR. The bass is more refined, unlike in the ported versions, the Lark and Lark-II. Generally, the Lark DCR bass is clearer and has better dynamics. Equally impressive is the midrange. Vocal clarity and transparency is outstanding. Midrange positioning is the way I like, slightly forward in the sound stage. As for the Goldwood GT-520, I can find no fault. It does what’s it’s supposed to do. No harshness. Listening to the Lark DCR, you wouldn’t know there’s a tweeter. It’s kind of invisible. After listening to the Lark DCR for a few days, I am amazed at the quality of these drivers. The SB16PFC25-8 cost only $27.80 at Madisound. The Goldwood GT-520 is a ridiculous $12.50 at Parts Express. That’s $40.30 in total per speaker. Yes, the SB16PFC25-8 has a plastic frame and the GT-520 has 2 deep notches, one at 9kHz and a lesser one at 18kHz. Do they affect the sound? Frankly, I can’t tell during playback.